We’ve tried the usual home remedies for nausea: warm ginger ale, tea with lemon and honey (I had to give Mr. Saver decaf tea, since the littlest bit of caffeine has him bouncing off the walls). I’m partial to flat Coca-Cola — I used to take the Coca-Cola syrup they sold back in the 80s, but I haven’t seen that in years. 1. Grate ginger root into a cup of tea. I’ve done it with ground ginger — not too bad. 2. Mix 1 tbsp each of apple cider vinegar and honey in a glass of cold water. 4. Mix 2 tsp. of wheat germ in warm milk. Have the drink every hour. 5. Eat saltine crackers. It’s an old standby for pregnant women, but it sometimes works for plain-old nausea. When I was a kid, dry toast and tea with honey/lemon were the go-to home remedies for nausea. Plain toast is boring, but you need “boring” when your stomach is trying to heave its way out of your body via your esophagus. I think I’d have to stick with the tried-and-true ideas, rather than the ones I consider to be “weird.” I’ll be taking a pass on ever trying the “rice water” tip or the wheat germ and milk gimmick. The apple cider vinegar and honey is a possibility. It seems that every illness has its own list of home remedies. Both Mr. Saver and I tend to shy away from any type of over-the-counter or prescription medicines, unless it’s just some Tylenol or Motrin every once in a while for a bad headache. Someone suggested a prescription drug called Compazine, but that’s a bit much. I’d rather this stomach bug just works itself out on its own. Have you tried any home remedies for your illnesses? How did it work out? 11 comments to Home Remedies: Yea or Nay? 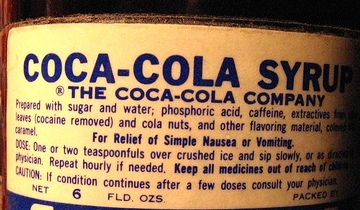 When I was very young and had a stomach flu that wouldn’t stop, our family doctor actually recommended to my mom that she microwave coke to flatten it and give it to me to drink–this works because of the sugar and salt in the drink that help rehydrate you the way that drinking only water cannot. Gatorade works quite well too and is found in pharmacies in Mexico quite often (I learned this when I got a tummy bug there). The last time I was sick to my stomach, I set my husband out for juice and cut it with water, but my situation wasn’t so bad–if it had been, I would have added salt. The rice water also makes perfect sense to me–particularly if you salt it. WE live overseas and sometimes find it hard to get good medical advice. We have a book with home remedies and often get online to try out home remedies. Unfortunately, they often don’t work and we end up going to the doctor for meds. I’ve got one for you Nicole. Grandpa was fond of mixing a teaspoon of baking soda with a glass of warm water, and drinking it down. Kinda salty, but not the worst tasting thing. I always thought it worked pretty well. My mom swore that Sprite and crackers or plain white bread made her feel better no matter what. I’m a big fan of cold ginger ale and Tums (but not together). The docs are turning more and more to home remedies and housewife cures…. They fobbed honey off for years but now they are taking a new serious look at it. In one study I read where they used Honey to treat burns, it was far far more effective than the commercial burns formula’s that they tested. Even I love rice, but boiled rice water?? Ewww… Hope you and the Mr. feel better soon! Ah for the stomach ailment there is not much you can do but ride it out and drink lots of clear liquids…eat soft foods to give your stomach a rest. But for a sore throat… lots of gargling with salt water and drinking a shot of tequila. Sipping tea with lemon and honey doesn’t hurt either! Sorry to hear your both feeling awful. I think I’m with you, stick to the tried and true methods you’ve used in the past. No need to upset your stomach’s more with the boiled rice water or wheat germ in milk, yuck! Hopefully the bug with pass soon. Take care!